Released in August 1996 for the SNES, Tetris Attack is a puzzle game with swapping tiles, which does not actually have anything to do with Tetris or attacking. 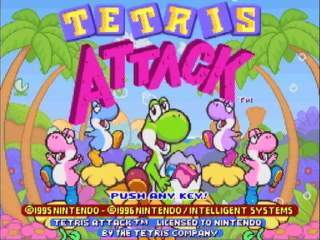 Tetris Attack was previously released as Panel de Pon in Japan, but Nintendo decided that skinning the interface with characters from Yoshi's Island would increase the game's popularity tenfold. They were correct. Note: Runs on stage clear mode are not allowed because they make people fall asleep.